System for selection and control of the various front and rear wiping modes for the elimination of rain and cleaning. The vehicle's front and rear wipers are designed to improve the driver's visibility progressively according to the climatic conditions. - rear wiping on engaging reverse gear. 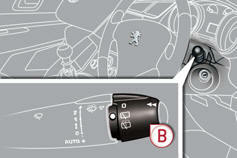 The wiper commands are issued directly by the driver by means of the stalk A and the ring B . A. Wiping speed selection stalk. Intermittent (proportional to the speed of the vehicle). Single wipe (press down and release). Automatic, then single wipe (see the corresponding section). If a significant accumulation of snow or ice is present, or when using a bicycle carrier on the boot, deactivate the automatic rear wiper via the multifunction screen configuration menu. When reverse gear is engaged, the rear wiper will come into operation if the windscreen wipers are operating. The function is activated or deactivated via the multifunction screen configuration menu. This function is activated by default. Pull the windscreen wiper stalk towards you. The windscreen wash then the windscreen wipers operate for a fixed period. The headlamp washers only operate when the dipped beam headlamps are on . In the case of vehicles fitted with headlamp washers, when the minimum level of the reservoir is reached, this warning lamp is displayed in the instrument panel, accompanied by an audible signal and a message in the multifunction screen. The warning lamp is displayed when the ignition is switched on, or every time the stalk is operated, until the reservoir is refilled. Next time you stop, refill the screenwash / headlamp wash reservoir. The windscreen wipers operate automatically, without any action on the part of the driver, if rain is detected (sensor behind the rear view mirror), adapting their speed to the intensity of the rainfall. This is controlled manually by the driver by pushing the stalk downwards to the "AUTO" position. It is accompanied by a message in the screen. This is controlled manually by the driver by moving the stalk upwards then returning it to position "0" . The automatic rain sensitive wipers must be reactivated if the ignition has been off for more than one minute, by pushing the stalk downwards. If an automatic wiping malfunction occurs, the wipers will operate in intermittent mode. Do not cover the rain sensor, linked with the sunshine sensor and located in the centre of the windscreen behind the rear view mirror. Switch off the automatic rain sensitive wipers when using an automatic car wash. In winter, to avoid damaging the wiper blades, it is advisable to wait until the windscreen is completely clear of ice before activating the automatic rain sensitive wipers. 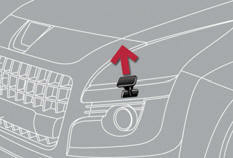 This position permits release of the windscreen wiper blades. It is used for cleaning or replacement of the blades. It can also be useful, in winter, to detach the blades from the windscreen. 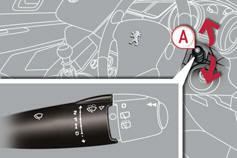 Any action on the wiper stalk in the minute after switching off the ignition places the blades vertically on the screen. To park the blades again, switch on the ignition and operate the wiper stalk. - replace them at the first signs of wear.